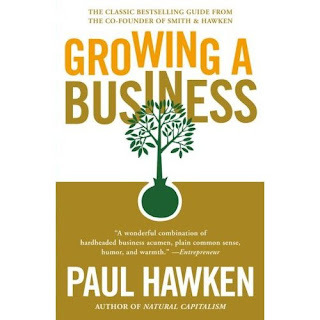 I just finished the book "Growing A Business" by Paul Hawken. I actually started it a year ago, but between audio books and online news articles, reading "real" books slowed down. Anyways (do you really care about my reading habits? ), since I've finished the book, I thought I'd share a little bit about it. This book is designed for people who want to start, or have just started a business. I would also say it's for any owner that is looking for ways to improve their existing business. In some ways it's a classic business book, but with a non-acumen bias. All the examples are simple and easy to understand. He starts from the beginning - do something you love - and goes through hiring and retaining people to help you grow beyond the start-up stages. Through the book he shares good examples and gives concrete ideas and tries really hard to keep the book generalized and timeless. One of my favorite things about this book is his view of patience. His business was bootstrapped (not that he used that word, it's too buzzy) and therefore gives advice on how to grow smart and slow. He talks about setting up structures so your business doesn't get too big and you lose control. His tips are practical and I felt like I could implement them right away. For example, he talks about getting permission from the market place to sell to it, and how to go about it. This is something I can work on right away with Univera. Amazon also has some good reviews as well. I recommend it.